We’d love your help. 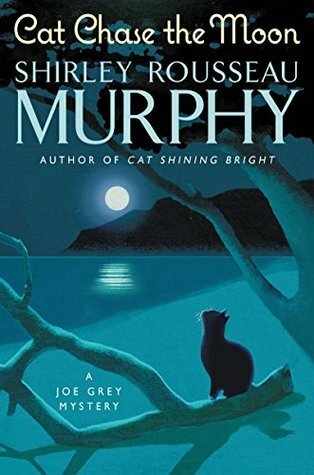 Let us know what’s wrong with this preview of Cat Chase the Moon by Shirley Rousseau Murphy. With his focus on finding Courtney, Joe Grey has neglected his detective work with the Molina Point Police Department. Before his daughter disappeared, Joe found a viciously beaten woman lying near the beach. Now the police investigation has stalled, and the clever feline worries his human colleagues may have missed a vital clue. Joe is also concerned about a family of newcomers whose domestic battles are disturbing the town’s tranquility. Loud and abrasive, the Luthers’ angry arguing, shouting, and swearing in the early hours of the night have neighbors on edge and the cops’ on alert. One of the couple’s late-night shouting matches masked the sounds of a burglary, and now a criminal is on the loose. To ask other readers questions about Cat Chase the Moon, please sign up. I always loved the books in this series and I loved this one. Joe Grey and the other cat are amazing and lovely as usual and it was like meeting old friends and seeing what was going on. The plot is complex, with various subplot that sometimes makes the book less engaging but pleasant nonetheless. Even if it can be read as a standalone I think this book is perfect of the fan of the series but it wouldn't be the best one to start it. I recommend it to cat lovers and whoever love this series. Many than I always loved the books in this series and I loved this one. Shirley Rousseau Murphy is the author of over 40 books, including the award-winning Joe Grey cat mystery series and three other novels for adults, the Dragonbards Trilogy and more for young adults, and many books for children. She grew up in southern California, riding and showing the horses her father trained. After attending the San Francisco Art institute she worked as an interior designer, and Shirley Rousseau Murphy is the author of over 40 books, including the award-winning Joe Grey cat mystery series and three other novels for adults, the Dragonbards Trilogy and more for young adults, and many books for children. She grew up in southern California, riding and showing the horses her father trained. After attending the San Francisco Art institute she worked as an interior designer, and later exhibited paintings and welded metal sculpture in the West Coast juried shows. Her work could also be seen in many traveling shows in the western States and Mexico. "When my husband Pat and I moved to Panama for a four-year tour in his position with the U. S . Courts, I put away the paints and welding torches, and began to write," she says. After leaving Panama, they lived in Oregon, Atlanta, and northern Georgia. During that time she wrote her children's and YA books, winning five Dixie Council of Authors and Journalists awards. Murphy now lives in Carmel, California, to which she and her husband moved when he retired as Chief U.S. Probation Officer for the Northern District of Georgia. She has so far published 19 books in the Joe Grey series and is working on another. She welcomes email from her readers, which can be sent to srm@srmurphy.com or through the contact form at her website www.srmurphy.com.